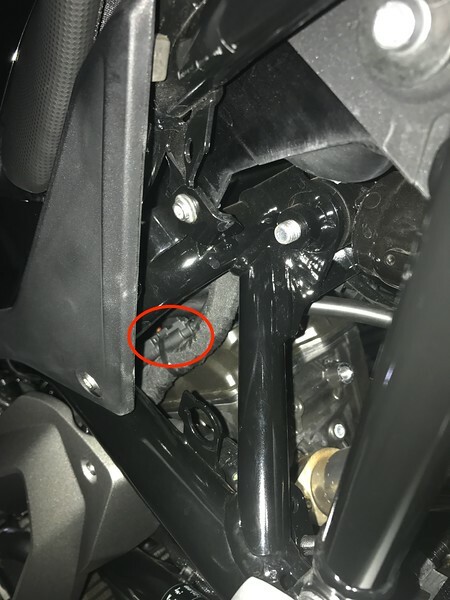 BMW G310 R/GS Forum > 2017+ BMW G310 R / GS Tech Section > Electronics > Electrical Socket Location? As you all know, I'm a new rider so technical motorcycle knowledge isn't my thing (at the moment!). I'd like to ask if someone can show me with a picture where the electrical socket is? I read the manual that it's on the left side near the spring but I can't seem to find it. I can only find the detachable plastic cap but not the socket itself. For reference, I will need to know for future accessories like GPS, phone charger, etc. The electric socket is an optional extra which does go in the hole where the plastic cap is and does not come with the bike when bought new. The socket is the same as the part for the F800GS so it is readily available. My dealer said that the socket was not available yet - the salesperson couldn't be bothered to check if sockets from other BMW bikes would fit. If you look above the mounting hole, you will see the lead for the socket zip tied to the wiring harness. MandatedMotorvation and kmonroe99 like this. So if I understood correctly, I should be able to buy a socket at my dealer? Unfortunately because I'm at work right now I cannot check it. Yes, you can buy a new one. Get your dealer to check the part number of the G310R socket is the same as the F800GS. Why not try and get a used socket from a motorcycle breaker as I did as it cost me less than half what a new one would cost. Good to know, thanks a lot bro; much appreciated! I've managed to get the socket and i know where to stick it but they have managed to do a good job of hiding the plug. What does the plug look like and where would it be on the bike ? I have the sneaky suspicion that they have cable tied it so far out of the way that panels have to be removed first according to Murphy's law. The plug, which has an end cover (which you remove) to keep it clean until connected, is zip tied to the wiring harness above and left of the socket hole on the frame. I had to re route my plug as the nice man who built the bike had routed it up so it couldn't reach the socket. I finally found mine after taking the Tank cover off. the ******* was well hidden and not the five minute job as per worship manual. Here's a pic looking up up under the rear of the tank on the left side. I gather the connector is zip tied to the existing loom (circled, the plug socket hole just below). So if you can reach under, no need to remove the tank unless you want to run some wires. Does anyone know what type of plug it is and where I can buy a corresponding plug? I want to install a usb charging port, I'll probably use the front auxiliary plug (behind the front light).